Bearden was dedicated to acknowledging and honoring the two major schools of art that influenced him: the Harlem Renaissance and the European masters of the 15th and 16th centuries. Bearden’s painting, La Primavera, an allusion to a piece painted by the Italian master Sandro Boticelli in 1478, recognizes the latter. Similar to Boticelli’s painting, La Primavera shows a meeting between Chloris and Zephyrus. According to Greek mythology, Zephyrus, the west wind, rapes Chloris before turning her into a goddess of spring, Flora. It is unclear which of these two meetings between Chloris and Zephyrus Bearden depicts, but the message that good can come out of an evil act would have been especially timely during the violence and rioting of the 1960s. 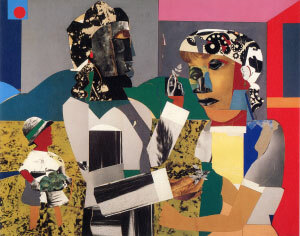 Romare Bearden, La Primavera, 1967. Collage and mixed media on board, 44 x 56 in.